JERUSALEM — The border between the Gaza Strip and Israel was quiet on Friday after a reported Egyptian-brokered truce calmed a deadly, two-day outburst of violence. Al-Aqsa TV reported late Thursday local time that a cease-fire deal between Israel and Hamas — the Palestinian militant group the runs the strip — had been mediated by Egypt and other regional players, it said. 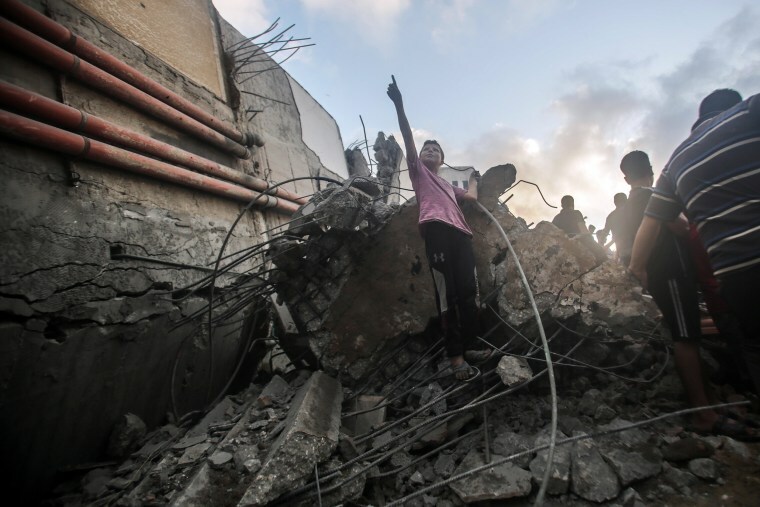 Israeli officials, who did not comment on the reports, say the latest round of strikes hit 150 military targets and came in response to 180 rocket launches from Gaza. Thirty rockets were intercepted by that country’s “Iron Dome” defense system. Four Palestinians, including an unborn child, were killed over two days, according to Health Ministry officials. Ali Algandor, 30, died Wednesday. And overnight Wednesday to Thursday, a 22-year-old pregnant woman was killed along with her 1-year-old daughter, officials said. The woman’s husband was also injured. Eleven people were wounded in the Israeli city of Sderot near northern Gaza after six rockets were fired from the strip. Israeli officials said that one woman was seriously wounded in a rocket attack, and 20 other people have also been hurt. Some of those people were admitted for shock. Israel has fought three wars in Gaza in the last decade — the latest in 2014 — and fears are growing that a new conflict is on the way. Any cease-fire will face a test later on Friday, as Palestinians in the narrow strip of land blockaded by Israel and Egypt planned on resuming weekly border protests. After a quiet night, Israel's military told residents in the south of the country who had spent much of the past two days in rocket shelters that they could return to their daily routines. The area has suffered weeks of intensifying rocket attacks and fires set by incendiary kites and explosive balloons. Talk of a cease-fire began around July 20 after officials said gunmen killed an Israeli soldier near the border, which prompted Israeli strikes by warplanes, tanks and artillery that were said to have left at least four Palestinians dead. The U.N. Special Coordinator for the Middle East Peace Process called for calm in a statement on Thursday. "For months I have been warning that the humanitarian, security and political crisis in Gaza risks a devastating conflict that nobody wants. The U.N. has engaged with Egypt and all concerned parties in an unprecedented effort to avoid such a development," Nickolay Mladenov said. "Our collective efforts have prevented the situation from exploding until now. If the current escalation however is not contained immediately, the situation can rapidly deteriorate with devastating consequences for all people," Mladenov said. Gazans have held weekly protests since March 30, some of which have become violent, to demand the right of return for Palestinian refugees. Some 70 percent of Gaza residents are descended from or themselves refugees driven from their homes after the creation of the State of Israel. More than 150 Palestinians have been killed during the recent protests, and a Gaza sniper killed an Israeli soldier. Egypt and the United Nations have been trying to mediate a cease-fire, stop the violence from escalating and ease profound hardship in Gaza, which is home to two million Palestinians. A political impasse between Hamas and Fatah, the faction that dominates the Israel-occupied West Bank, also has made it impossible for Palestinians to present a strong or united front. Israel lays the blame for the violence on Hamas. "We will continue to defend our citizens against terror rockets as any other state would," said Israel's Permanent Representative to the U.N., Danny Danon, on Twitter. Thursday's fighting brought back memories of the most recent war, in 2014. Air raid sirens wailed in southern Israel overnight and throughout the day, sending families scrambling into bomb shelters, canceling outdoor summer cultural events and forcing summer camps indoors. The Israeli air force, meanwhile, pounded targets across Gaza. Lawahez Jabari reported from Jerusalem; Paul Goldman from Tel Aviv; Phil Helsel from Los Angeles.